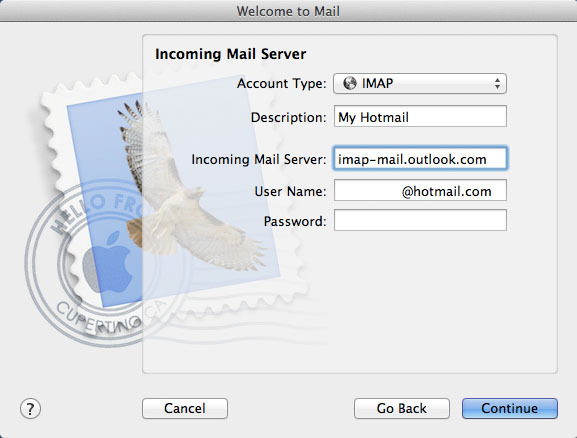 Outlook.com (Hotmail) setup with IMAP in the Apple OSX Mail App. 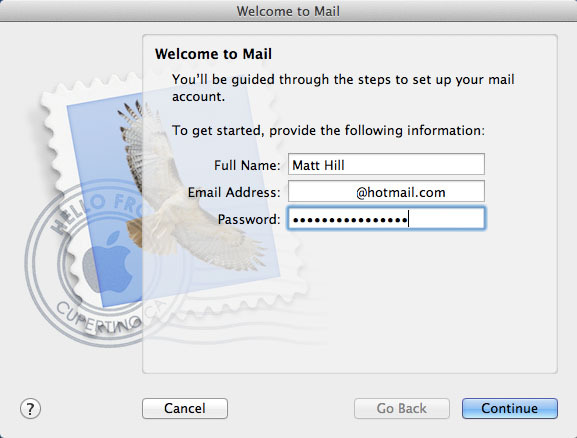 By default if you want to access your Outlook.com / Hotmail or MSN email account in the OSX Mail app you had to do it with POP. Using POP is not ideal as it simply downloads the massage from the Outlook servers. You can not organise your email and sync changes back to Outlook, and between devices such as your desktop pc, laptop and mobile. Although not as good as Exchange Active Sync which is supported by most smartphone and Outlook 2013 on Windows, Mac OSX users can now use IMAP to sync mail to OSX. 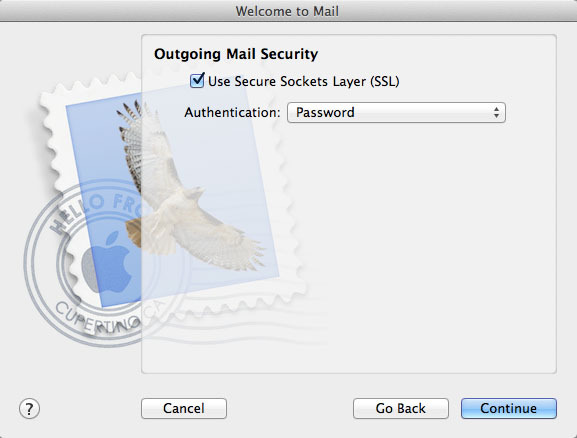 Open Mac Mail, from the File menu, choose Add Account then enter your Hotmail, Outlook or MSN email address and password, finally clicking continue. The account type you need to select is IMAP, you can enter anything you like for the description. The username is [email protected], your password is the password you usually use to sign in to outlook.com unless you have two factor authentication enabled. If you do have two factor authentication enabled you will need to create a unique password for the OSX Mailapp which i will show you how to do below. For users with two-step verification enabled you must log in to http://account.live.com/ and create a new app password. This app password is what you will use in the OSX Email client, not your actual password. Any changes you make to your inbox will be reflected on other devices your email account is setup on. That it, you should hopefully be able to access your Outlook.com email account on OSX using an actual email client and not the webmail interface. Thanks, works a treat on android with aqua mail, only change was changing SSL type to any. it does not give me the option to select ACCOUNT TYPE: imap, it automatically chooses pop and does not give a drop down box to change it. Is there a way to change it to imap? 3. Mail will now try to connect, but will return an error message for that. However, once you’ve gotten the error message, you should be able to proceed. 4. now change the account type to IMAP instead of the pre-defined POP, change the outlook credentials into the Hotmail ones and make sure all other credentials including the IMAP servers as mentioned above, are correct for use with your Hotmail account. 5. After all the above steps, you should be able to use your Hotmail account as IMAP Hotmail after all. Hope this works for you guys too. Sandra…your solution to Rich’s problem which I also had finally made it work for me…thanks!!! Unfortunately I have to comment on my own workaround: although I first thought this worked perfectly, I have to come back and confirm later comments: I don’t have experience with how Outlook accounts work with these IMAP settings but at least the hotmail IMAP settings through above workaround don’t allow 100% IMAP-synching. Sorry for that and if someone knows a 100% working solution, please let me know, even alternative account suggestions that allow 100% IMAP functionality are welcome. Did you remember to change the port to 587 and select the encryption type as SSL? Hi, I’ve been trying to set up the Hotmail account following the above mentioned steps and I managed to get all the folders synced BUT the Inbox. The Inbox does not manage to synchronise and remains empty. I’ve been googling and seeing that this is a known problem. Do you know if there is a workaround? Do you have a lot of mail in your inbox? I imagine that would take a long time to sync initially if you have years and years worth of email in, with large attachments. I have some folders that took a good hour to sync that have a lot of email / data in from years gone by. Maybe leave it trying to sync over night or move email out the inbox in to folders, presuming you have a large inbox that is. I could not set it up as IMAP account as did not have the option to do. As soon as I say @hotmail.com it sets it up as a POP type. I followed Sandra’s instructions in the replies above. It did download my inbox and other folders’ contents. However, when I delete an email from inbox, or move it to one of the folders on Mail it doesn’t affect the Hotmail account. Furthermore, another Hotmail account was created on my iPhone containing all my emails as unread, in addition to the original one that I use. I do indeed have a lot of emails. My Inbox dates back to 2005. However, not even one email gets downloaded to my Inbox folder. Do you know how to archive old emails in Hotmail at once, withouth having to select each and every one of them and sending them to another folder? Hi Matt, I delete my hotmail account from the mail to follow the steps above, but when I type the same email address it jumps and don’t allows to follow the steps. Hope you can gel me with this. Thank you. You have to do it through a workaround, not entering your hotmail address but instead a format like this: [email protected], then continue and afterwards change back your e-mail address to the right hotmail address. Thanks for all the info, I’m definitely closer to what I’m looking for now. My problem is my mac mail will only sync back to hotmail the read status, read or unread. But it won’t actually show them deleted from my mac. I’ve sent some test messages using the 587 code and while watching on my iphone, I will highlight the message on my mac. A couple seconds later, it shows that message as read on my iphone…great! Then I delete the message on my mac, and nothing happens on my iphone. I’ve refreshed my iphone mail and nothing. I’ve tried to sync all mail on my mac with no joy either. Any suggestions and why does this work differently with each person while running same setups? and what about folders on hotmail? Will this carry them over? You are the man Matt, that worked for me. I know these companies are in competition with each other but why be such a bunch of cagey assholes. works like a charm!! Have been waiting for this forever!!! Matt I have followed all the recommendations including the one from Sandra but even though i take my account offline and online again I cannot get it to do anything, even send me the error msg mentioned above. I set my hotmail in my old mac and I do not recall having this much trouble. I tried adding a new account but that did not work either. Suggestions? Hi, It certainly worked for me. I was ableto set up the account Ok and my hotmail files have all downloaded. I have a similar issue to Dave – if I delete a mail from my iphone or ipad then it also deletes from the mac but if I delete a file on the mac, it does not delete it on iphone / ipad. Was able to sync my hotmail to MacBook Pro email via Sandra’s workaround. BTW, called Apple Care and asked for their help, the only suggestion they had was to change settings in Hotmail. Thank you Matt. These the only set of instructions that actually worked for me & that was after trying about 3 others from online forums. Thanks so much for these tips Sandra and Matt! It worked perfectly for me – I was soooo frustrated until I tried your tips! Thx a million!!!! I agree with Alicia’s comment!! No, you cant do that with IMAP sadly, you need Exchange ActiveSync which no mail client on OSX supports. Hi Matt, your solution works to a degree but not 100% – additional help needed if poss. I even created a new hotmail account to make sure it wasn’t setting on old account. Problem same as a couple of others. Can receive mail in OSX Mail – Version 7.1 (1827) – Mavericks 10.9.1 and on iPhone 7.0.4 and on Hotmail Web account if I read, delete and file in folder on iPhone and and Web client no problem as you would expect as Microsoft have made changes to allow this. My problem is on the OSX Mail client. On receipt I can open mail and that will be reflected on iPhone and Web Client – However if deleted or moved nothing happens on iPhone or Web Client. Thanks SO much for this! My only question is now that I have this set up and am having the same SMTP port issue as mentioned above (Port 587 doesn’t seem to be working when I try to send mail out), how do I change the port back to 993? DO I have to completely delete the account and re-enter it with the SMTP port changed to 993? Thanks! Actually I figured it out…It just still isn’t working… Maybe I’m missing something. Or maybe apple changed something? Hi everyone. I have tried most of mentioned solutions but I have one permanent problem with propper setting up the account. Mail simply does not accept my password saing that “Mail can not connect to outlook account” nad requires password – nothing happen after propper password enter. Does somebody knows a solution? Are you using two factor authentication? If you so need to create a one time password as mentioned in the blog. I’ve had exactly the same problems with emails failing to sync correctly, but I’ve had additional problems too – drafts are saved and are appearing in my inbox, sometimes multiple times. It also appears that sent messages are also appearing there too – anyone have any ideas? Ah, transpires that the problems highlighted above are down to some rules that I’d got setup at Outlook.com. Amended those, which improved matters. I’ve tried the same using Postbox from http://www.postbox-inc.com and it works without a problem. Looks like some sort of issue with mail.app. Ah, it *appeared* to work with Postbox, in that the messages appeared to move, in Postbox. Logging into outlook.com showed that not only had the emails not moved, but that copies were being made instead. Thanks a lot. Really helped me tackle this. No, Outlook / MSN / Hotmail doesn’t provide CardDAV or CalDAV access for contacts and calendars. Exchange Active Sync is supported, however i’m not aware of any OSX email clients that support Exchange Active Sync. I have managed to set up the IMAP account based on the descriptions mentioned above. Nevertheless, it only syncs one way. Meaning, once I have opened an email on one of my devices (Ipad or Iphone), it will still be unread on my Imac. However, once I have opened an email on my imac, it will also be read on my iphone and ipad. Could anybody tell me how to deal with this problem? Have you given your iMac enough time for it to properly synchronize, because I used to have the same problem but after waiting a bit longer, it did synchronize properly. Good luck! Ive tried all options. I seem to be able to set it up as IMAP but after its set up, a password prompt keeps appearing in mail rendering it useless. Hi Matt – I have updated my details and the mail seems to be working now but all my hotmail folders are gone – is there a way to bring those in too? From what you say i dont think you are subscribed to the other folders, meaning only your main inbox will show up. Highlight your email account and click the Advanced tab. I am having problems setting up my smtp for outgoing mail on macmail for my hotmail. I know I am supposed to check TLS encryption. Does anyone know what the code should be in that field ? If by code you mean port, you should be able to use port 25 or 587.
thanks, that was driving me insane this morning. All sorted on all devices now.